Let’s start off with an easy one: where were you born and raised? Haha, thanks for the warm up question. I was born in Melbourne, it’s a beautiful city in the south east corner of Australia with a population of about 4 million. It’s one of the biggest centers of immigration in Australia so there’s a really lively mix of different cultures and it’s a great place to live. What were some of your favorite activities as a child? Like most kids, I guess, I played a lot of sport with my school friends – Australian rules football, soccer, cricket and later baseball. I enjoyed reading and riding my bike a lot, and still do. I was lucky to enjoy a lot of time at the beach during summer holidays and never saw snow until I was an adult. As a child of the 80s I probably spent too much time playing the early console games… One of my friends had an Atari. It was about 10-15 years before I learned the meaning of that word :). I didn’t play a great deal of board games as a child, if that’s what you’re wondering. I did play a little chess, but didn’t really pursue it as an interest because I never had anyone to play with. I’ve read that you started playing go after watching the film Pi. Do you recall what it was that drew you to the game? I guess I didn’t really understand what I was getting into, but the film portrays the Go board as a microcosm of the endless possibilities in the world. There was something that intrigued me about that. Almost two years later a friend and I finally got around to learning the game. Pi’s about a mathematician who’s trying to find a pattern in the stock market. Go is used as one example of the inherent complexity in apparent simplicity. The difficulty in understanding our world through numbers starts to drive the main character crazy and he attempts to draw connections between pi, the stock market, the Torah and all kinds of other things. It’s not a particularly pleasant film and, like many that feature Go, you realize the Go scenes are unfortunately not very well done after you rewatch it later. Perhaps there’s a job opportunity for a Go player there. It’s a sort of psychological thriller, if you enjoy that sort of thing you might be interested in checking it out. Do you remember what the first days and months were like? I remember that, to begin with, I was fascinated by the concept of two eyes, and the way it appeared as an emergent property of the very simple rules. That’s probably what drove me to keep playing for long enough to find a deeper enjoyment of the game. But there was something else about Go that felt different to other board games and I’ve never been quite able to put that into words. I think one of the weaknesses of Go is that unless you have that kind of intrinsic interest at the beginning, there’s a lot to learn before it starts getting really interesting. I think we need keep improving out methods for teaching new players to overcome that. Another thing I remember from the early on was having lots of dreams (and daydreams) about the game while my brain was presumably trying to figure something out. I’ve talked to a few other Go players about this phenomenon and most of them experienced it too. Fortunately, it tends to stop happening after a little while. If you could, would you have wanted to start playing go at an earlier age, and would you like to have been a professional? In which country? I guess it would’ve been easier to learn at a younger age, though I consider myself fortunate to have started playing when I was 20, at a time when information about the game was much more widely available in the West than ever before. We owe previous generations of Go players a lot for that. As for becoming a professional, I’ve never really wanted that for myself. It would have been a very different life and I’m happy with the one I have. I don’t think it’s worth reflecting too much on if and what type questions. Ultimately there’s only the present moment, so if you want something different out of life you just have to start now and work with what you’ve got. Did you have any professional or amateur teachers? Or did you study on your own? Until I was about 3 dan, I mainly just played games and studied on my own, but of course I had informal teachers. I used to go to the local Go clubs in Melbourne and there were stronger players there. I also participated a lot in the KGS teaching ladder. Later on I had paid lessons with a strong Chinese amateur, then Yilun Yang and finally my current teacher, friend and partner in Go Game Guru, An Younggil. You can learn different things from every teacher and can usually combine them together later, after enough reflection. Have you ever faced any walls in your go playing? What helped you climb over those hurdles? Yes, of course. In the early days (between 30 kyu and 10 kyu) I remember that being stuck at a particular rank on KGS for a couple of weeks seemed like a big deal :). Thinking about it now, it seems funny to worry about that at all. Back then it was easy to jump a few ranks just by reading (or re-reading) a good book. The most significant barriers I remember were around 5 kyu, 1 kyu and 3 dan. I haven’t experienced any since then, but that’s partly because you improve so gradually after that anyway and partly because you learn that it’s all in your mind anyway. You are learning all the time, but that won’t always express itself in a tangible and immediate way. In terms of getting over hurdles, I think that’s quite personal. Some of the things that have helped me included taking a break, reading a good book, reviewing my games, having some lessons, solving lots of problems and not caring too much about winning. On not caring too much, I’ve hardly thought about what level I am for years and I stopped measuring myself with a ridiculous, all encompassing, number back when I reached ‘5’ dan (whatever that means). Often the thing that stops us improving or makes us lose games is desperately grasping for a win. When you lose, it’s really important to stay calm and be able to learn as much as you can from your mistakes. It’s a great opportunity to improve actually. Rank obsession is just another angle of that desire to win, and I believe it makes you weak. If you feel like you’re stuck and are getting upset about it, you’ll be stuck for longer because you’ll lose more games and you’ll learn more slowly. Sometimes when I tell people this they say that they can’t play well if they’re not trying to win, but it’s not about playing slack moves and not trying – that’s just lazy. What I’m trying to say is always strive for the best moves in every situation, but rid yourself of that ‘need’ for a win that the emotional part of your brain wants so badly. If you can replace it with the satisfaction of each and every move, you’ll find that you win games anyway. Another important aspect is learning how to learn Go efficiently. It doesn’t pay off to put a lot of time and energy into it without first thinking about what you’re doing and why. Learning that sort of thing, has helped me to keep gradually improving at dan level and it actually seems easier to improve now in some ways, albeit slowly. Which pros do you study or follow the most? Who has your favorite style? Well in terms of studying pro games, I’ve played through Shusaku’s games much more than any others, mainly because Invincible is such an excellent book as far as game commentaries are concerned. Of the Edo period players I enjoy Ito Showa’s games the most. Even though he wasn’t necessarily the strongest, there’s a nice flow to his play. Of the more modern players, I enjoy Meiyo Kisei Fujisawa Shuko, Cho Hunhyun, Kato Masao, Seo Bongsu, Gu Li, Lee Sedol, Kong Jie and Park Younghun. If forced to choose one, it would probably be Seo, but it’s very hard to play that style because it relies on you staying very sharp all the time. It’s a kind of flowing, fighting game that relies on you noticing and seizing very small opportunities in the middle of a normal looking sequence. Playing a thick and patient fighting style is easier in my opinion. Of contemporary pros, I feel Kong Jie’s style is quite well balanced and I usually enjoy his games. Who are your idols, both inside and outside of the go world? In the Go world they would be Cho Namcheol and Seo Bongsu. Cho, because he was instrumental in establishing professional Go in Korea and helping Korean baduk get to where it is today. Undoubtedly he had help, but I think he shows what a difference one or more passionate and determined people can make. 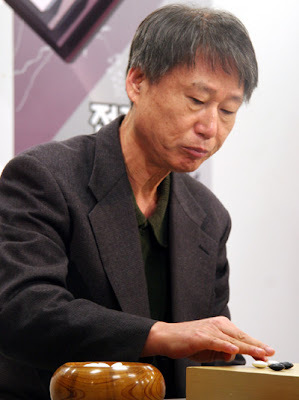 Seo Bongsu, because he never went to Japan to study Go, but was able to challenge and defeat top Japanese masters of his era, back when Japan was still regarded as dominant. He shows Go players everywhere that they can continue to improve and reach a high level without going overseas to study. Unfortunately he lived mostly in the shadow of Cho Hunhyun, otherwise he’d be much more well known. Outside of Go, Nelson Mandela, Arnold Schwarzenegger and David Allen are three. I think most people will be familiar with Nelson Mandela’s story. He was in jail for 27 years (and spent much of it in solitary confinement) for his non-violent opposition to racial segregation. Most people would have been crushed under that kind of oppression, but Mandela didn’t lose faith in his dream. When he was finally released, he showed amazing forgiveness and compassion, rather than turning to anger and retribution. We need more leaders like that in the world. Arnold Schwarzenegger may surprise some people. Most people just think of him as a musclebound Hollywood star, but I think there’s more to the man than most people realize. I read a few years ago that from very early on when he arrived in America he told a couple of people his goal was to become the US President. He could hardly speak English at the time and people didn’t take him very seriously. He can’t become President because he was born overseas, but he did become the Governor of California. When you look at it from that perspective you realize that all the body building, movies and so on were just a means to an end for him. We like to think movie stars are stupid, but not all of them are. David Allen wrote a great book called Getting Things Done, as well as a few others. Rather than an idol, he’s perhaps a sort of mentor (though I’ve never met him). He’s influenced my life greatly, in a very positive way. If you could play a game with any go player from any period, who would you choose? That’s a tough question, don’t you usually give someone three wishes? It would be interesting to see just how strong some of the ancient masters, like Dosaku, were. However, I think it would have to be Fujisawa Shuko sensei. I’d love to have a lesson with him. What is the go scene like in Australia? I think more and more people are continuing to take up the game, but in terms of the organized Go scene, it’s not so good. We have the challenge of a relatively small population spread around a huge land mass. People have to travel a lot to play in tournaments so I suspect most people decide it’s just easier to play online. I used to be quite involved in the (Australian) AGA, but I decided I could achieve more through our website, Go Game Guru. We’ll have to see how it goes. In a report from the AGA (American Go Association) dated May 2010, it was said that only you and Australian Go Association President Neville Smythe were the attendants of the local go club. Has it expanded since, and by how much? Neville is the Vice-President, though he was the President for many years and has been involved in the AGA since it was founded. It used to be that Neville and I were sometimes the only two and a couple of other stalwarts would turn up reasonably often. The situation has improved slightly, but I don’t make it to the club as often as I used to because I’m usually working on Go Game Guru. Unfortunately I’m the one letting them down now, but there’s only so much Go you can handle in a week. Now that I’m doing GGG, I try to find more time for friends and other unrelated activities. You participated in the World Amateur Go Championship (WAGC) in 2010. What was the experience like? Did you make new friends with your opponents? It was an amazing and unique experience and I was very fortunate to have the opportunity to go. There were people there from 60-70 different countries and I felt that aspect, more than anything else, was what made the whole event special. I imagine Olympians must feel a similar sensation on a larger scale. You get a whole lot of people from different cultures and circumstances in one room, and they’re connected by their love for this game. It’s great. I made quite a few friends and I still keep in contact with some of them on Facebook or by email. Maybe one day I’ll visit some of them. North and South America would probably be the first stops, but not anytime soon. It was exciting going to China and seeing some new parts of it. Every time I’ve been there I’ve been shocked and awed by the rapid pace of development in that country. It was also cool meeting some of the amateur players you frequently hear about online. I can put a few more faces to names now. I even had a stilted conversation with the North Korean representative in Mandarin at one point. He seemed like a pretty nice guy. The venue itself was simultaneously awesome and bizarre. The tournament was in the Tianyuan (=Tengen) Tower in Hangzhou, one of the most beautiful cities in China. The natural CBD of Hangzhou is centered around the West Lake, one of their main tourist drawcards. The Hangzhou government decided to build a new CBD elsewhere – and in the center they built Tianyuan – a very dramatic move. Other people have written about Tianyuan Tower before. It’s the home of the Hangzhou Go Association. They have one of the strongest and richest team in the Chinese Weiqi League. There are several floors (out of about 30) which house professionals, or children who are training to become pro, but the rest of the building is a hotel. There’s a revolving restaurant on the top floor which is designed to look like a Go bowl. At the hotel reception on the ground floor, there’s an enormous Go problem on the wall. What was strange about the whole thing was that this whole new city had been planned and built, but hardly anyone lived there yet, so it had this ghost town feeling about it. At times I felt like we were in The Truman Show. When did you start Go Game Guru? Younggil and I started Go Game Guru together in August 2010. I had been thinking about doing something like this for awhile and Younggil and I had discussed various similar ideas before. After going to the WAGC and talking to many people about the state of Go around the world, and what were some of the things that could be done about it, I came back and asked Younggil if he wanted to start Go Game Guru together. It was slow going at first, and we’ve taken it a bit more seriously as time’s gone on, so many people probably didn’t hear about our site until this year. After Jing started helping us we developed more rhythm and momentum. I’d always looked for a site like ours, but never found one, so we tried to build it ourselves. It’s certainly been a learning experience if nothing else. How do you feel about the positive reaction to GGG in the online go community? I’m happy, of course. We really appreciate that people regularly take time out of their day to visit us and we’ll try to keep getting better. Now that we have more readers to talk to, we have a better idea of what people want to read about. We’re continuing to learn, so the whole thing is a lot more efficient than it was at the beginning. We still have a long way to go if we want to achieve our goals though. What is your goal with GGG? The one thing the Go world needs more than anything else is a steady stream of new players. If we can get that one thing sorted out, many of the current challenges that people talk about will evaporate. Educating people about the game helps to deepen everyone’s enjoyment of it and strengthens its presence within new cultures too. Continually increase the number of new players. Help all players to get better at Go. I’m not personally very interested in founding institutions for pros in the West, establishing a unified ruleset, building new Go servers or any of those things. However, I am very happy that other people will pursue those goals. Everyone contributes in different ways. We intend that our way of helping will be to keep bringing more players to the game globally. Out of all the existing entities in the Go world, the ones that currently pursue these kinds of goals the most are probably Go associations and federations. They do excellent work and the sad thing from my perspective is that they are hamstrung by a lack of resources. When I went to WAGC, one of the things I learned was that Australia was not alone in this. Even though the organizations in some other countries appear to be in better shape than ours, they are really just slightly further down the road. The problem (as I see it) is that Go associations rely mostly on donations and annual membership fees (which are basically the same thing) for funding. They’re not really setup to be run like a business and people might feel uncomfortable if they started behaving like one. We’ve made it quite clear for some time that what we’re creating will be run as a business. However, the business world is changing and it’s already evolved well beyond the times where the only business model was to lock everything inside a walled garden for paying customers. If you look around you’ll see that many newer businesses combine free, community or open source products with premium offerings. The word ‘freemium’ has been around for quite a long time now. High quality, free, educational material for the public, including the best introductory course for beginners that’s available anywhere (Learn Go here). Most of what you see on our website falls under this category.It’s all licensed under Creative Commons, so it can be translated and shared on other websites (quite a lot of people are already translating and republishing our work, and if anyone else wants to do that, please contact me for the exact license). Improved, lower cost distribution of Go books and equipment. We got this started in a modest way quite recently, with the opening of our new Go book shop. What you see on the site though is just the tip of the iceberg.Really what we’re doing is building a global distribution network for Go products that will eventually make them much more affordable for all players worldwide. We already hold stock in multiple locations and the shop will always minimize the shipping for you by automatically routing requests to the closest location. We have to set this up in several steps to minimize the financial risks involved, so we’re not even close to reaching the full potential of this approach yet. Paid digital content; including further educational material and games broadcast from Asia via live and on-demand video. If and when we can produce revenue from the three things above, we’ll be able to put that money back into promoting Go in a way that benefits everyone in the community. Obviously we’re setting things up so that if more people start playing Go, we can increase the gross profits of GGG. If it works, we’ll be able to reinvest that money into further promotion; including advertising online and working with individual Go associations to run targeted local campaigns which we help to fund. We’d also be able to support other, unprofitable projects that were valuable enough to the community to keep running at a loss. What’s your dream, both on and off the goban? On the goban, my dream for quite a few years was to represent Australia at WAGC. Now that I’ve done that I’m more interested in Go Game Guru than myself, but I’ll always keep enjoying and learning about Go. Off the goban, pretty much what I laid out above. To create a sustainable business that exists to promote Go worldwide and continues to operate after we’re all gone. I realize full well that it’s a crazy idea, but sometimes you have to be the crazy who tries things. Late in 2010 I was on a flight with my wife where one of the engines ‘exploded’ in mid-air. We survived, but it did lead both of us to reassess our lives and what we wanted to do with them. I realized that I’d rather try to pull this thing off and fail very publicly than to spend the rest of my life wondering what would’ve happened. After that I got serious about driving Go Game Guru towards what it’s going to become and I haven’t stopped since. Haha, maybe you wouldn’t think so based on what I’ve already told you, but of course I do. I do a lot of cycling and jogging, though I know many wouldn’t class that as a hobby. I also really like cooking, gardening and eating. Eating is arguably what drives the interest in all the others :). My wife and I take dancing lessons from time to time, but we aren’t as good as Takemiya. And finally, what is the single most important advice you can give to a go player? Can I say two final things please? Firstly if people believe in what we’re trying to achieve I’d ask that everyone please think about us the next time they want to buy something Go related. The hardest thing for us will be the next few months where we have to let people know that our shop exists. We are not a charity though, and I think you’ll find that our prices are quite competitive – and will keep getting more competitive. Give us a go and if you have a good experience, please let your friends know about us. Secondly, what Go taught me more than anything else is the importance of balance, in a global context. Go can teach us some things about life, but life itself has infinitely more depth and breadth to it. Even for a self-confessed Go nut like me, Go is only a small part of the board. We all need to create balance in our lives between our hobbies, our work and our family and friends. If you get too obsessed with Go you’re like a player who fixates on winning the fight in one corner and loses the game. Enjoy Go, but keep it in balance. And since I’m telling you that, after everything else I’ve just said, you know I’m serious, right? You can follow GoGameGuru on Twitter as well as Facebook and enter to win a free book from the newly-opened book shop here.